Gold-filled is a high-quality tarnish resistant layer of gold over a base metal core (either brass or copper) that is in common use by jewellery designers in the US as a valuable, affordable option without the price of pure gold - this product is pressure bonded gold onto a base, a much thicker layer of gold than plated products - ours is industry standard 1/20th 14 karat gold over base (1/20th of the weight is a layer of 14K gold), this is a product we have used in our own jewellery for some time, making pleasing and durable jewellery. 1 Gold Filled Round Bead 6mm. 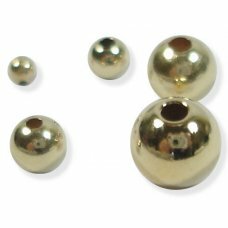 1.5mm hole	Gold filled is a relatively thick gold layer pressu..
10 Gold Filled Round Beads 4mm. 1mm hole	Gold filled is a relatively thick gold layer pressu..
10 Gold Filled 5.5mm Jump Rings 0.8mm thick, approx 4mm inside diameter Gold fill..
10 Gold Filled 4mm beadcaps with pressed flower petal/ scallop detail. These are the type..
1 Gold Filled 7mm Bolt Ring Clasp Marked 1/ 20 14k GF Gold filled is a relatively..
10 Gold Filled Crimp Covers these cover and tidy up small tube crimps simply crimp as normal th..
10 Gold Filled 50mm, 2 inch Headpins 0.5mm. 24ga Wire 1.8mm head. Gold fille..
10 Gold Filled calottes/ clamshells Use for trapping a a bead at necklace ends	Gold filled i..
1 Gold Filled Split Ring 5mm Gold filled is a relatively thick gold layer pressur..
50 Gold Filled 2x2mm Crimp Tubes Gold filled is a relatively thick gold layer pressure bon..
2 Gold Filled crimp end caps.0.8mm internal diameter. 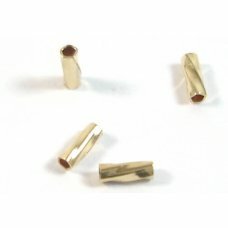 These end caps are suitable for terminati..
10 Gold Filled Bicone Beads. Great complement to Swarovski bicones. Measure approx 3mm diameter..
1 Pair GoldFilled Leverback Earrings. Marked 1/ 20 14K	Gold filled is a relatively ..
1 Gold Filled Lobster Clasp approx. 10x4mm. Marked GF & 14K 1/ 20	Gold filled i..
1 Pair Gold Filled Spring Earclips eith opening jump loop. Marked 1/ 20 12K GF Go..
10 Gold Filled Chain Plaque/ Spacers add these to chain to create interest/ as spacers or use t..
10 Gold Filled Silver Wire Protectors/ Wire Keepers use these to protect your beading wire or t..
10 Pierced gold filled ear fitting butterfly scrolls	Gold filled is a relatively thick gold ..
20 Gold Filled Round Beads 3mm. 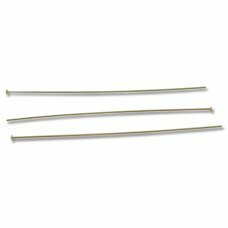 1mm hole Gold filled is a relatively thick gold layer pres..
10 Gold Filled 1 inch Headpins 0.6mm Wire 1.8mm head. 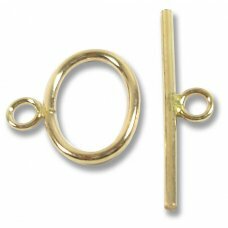 Gold filled is a relatively..
1 Gold Filled 6mm Bolt Ring Clasp Marked 1/ 20 14k GF Gold filled is a relatively..
10 Gold Filled 4mm Jump Rings 0.6mm thick. Approx 3mm inside diameter Gold filled..
20 Gold Filled Round Beads 2mm. 0.8mm hole	Gold filled is a relatively thick gold layer pres..
1 Gold Filled Split Ring 6.5mm	Gold filled is a relatively thick gold layer pressur..
10 Gold Filled 3mm Jump Rings 0.6mm thick Gold filled is a relatively thick gold ..
1 Gold Filled 14mm caribiner clasp. Marked GF & 14/ 20. Gold filled is a rela.. Pair Gold Filled FishHook Style Earrings with coil and bead detail. Marked 14K GF. ..
1 Oval Gold Filled filigree pearl clasp with security hook. Meaures approx 12.5 x 6mm. Hoo..
10 Gold Filled crimp end caps. 0.46mm internal diameter. 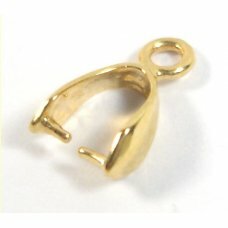 These tiny end caps are suitable for t..
10 Gold Filled necklet tags. Used to finish off bracelets and necklaces professionally by joini..
1 Gold Filled 9mm caribiner clasp perfect size for chain based necklaces and dainty bracel..
1 Goldfilled Large Soldered Ring measures approx. 15x2mm good for links earrings for attac..
1 Gold Filled Lobster Clasp approx. 14x5.5mm. Marked GF & 14K 1/ 20	Gold filled..
10 Gold Filled Round Beads 5mm. 1.5mm hole	Gold filled is a relatively thick gold layer pres.. Pair Gold Filled Ear Studs 4mm ball with open ring connector supplied with plastic stops. ..